At the end of last month the government released the latest UK poverty statistics. 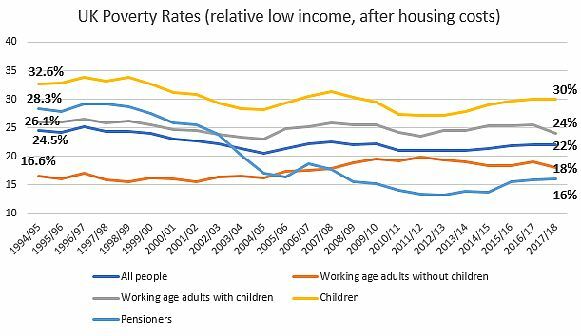 The child poverty figures gained the most attention with the data showing a rise in the number of children living in deep or ‘severe’ poverty. This means that of the 4.1 million children in relative poverty, 2.8 million are in ‘severe’ poverty. There are 3.7 million children in poverty under the alternative absolute poverty measure. Many readers will be aware of the rise in in-work poverty in recent years. An incredible 70% of children living in poverty are now in households where at least one adult is in work. Whilst children in households where no one is in work are still at greater risk of poverty, the rise of in-work poverty is a sign that employment is not an effective route out of poverty for many families. The figures also showed a rise in inequality, with the incomes of the rich growing at a faster rate than those on lower incomes. Some are projecting that the child poverty rate will reach a record 37% by 2022, breaking the record high of 34% set in the early 90s, unless action is taken. In response to the figures being published, End Child Poverty (ECP) called on all the major political parties to develop an ambitious and coherent child poverty reduction strategy ahead of the next General Election. ECP also wants to see an end to the benefit freeze and a full reversal of the two-child limit in his November budget. GMPA is a member of End Child Poverty and supports these calls. We are highly concerned about the impact of ongoing welfare cuts in Greater Manchester, where an estimated 620,000 residents are living in poverty. 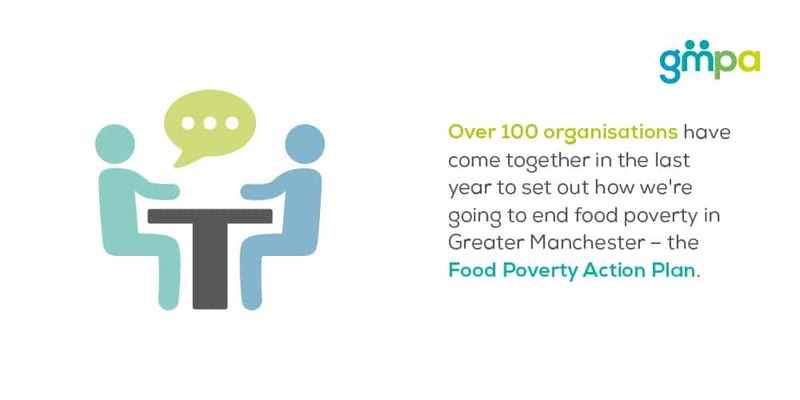 These pledges show Greater Manchester’s resolve to take action on hunger, and more than that, it shows an understanding that through coordinated strategic action we can start to address the underlying causes and ultimately work to eradicate food poverty in our city region. HMRC wishes to raise awareness of the new rates of pay that will come into force when the National Minimum Wage and National Living Wage increase on 1 April 2019 to ensure that all employers are at least paying their staff the legal minimum. A website to assist employers is available and employers and employees can contact Acas for advice and support on a wide range of employment rights and responsibilities (or call 0300 123 1100 from Monday to Friday, 8am to 6pm but check your call costs first as they vary from 3p to 40p per minute). HMRC also want to encourage low-paid workers to come forward to make sure they are getting the wages they are legally entitled to. They are looking to raise worker’s awareness of their entitlement and asking them to report any under-payments for HMRC to investigate if necessary. HMRC believe that many people who are paid the National Minimum Wage or National Living Wage still lose out on their full entitlement because of a series of common errors made by their employers. Workers often don’t realise that they are being short-changed and that it’s possible for them to get back the money they are owed. 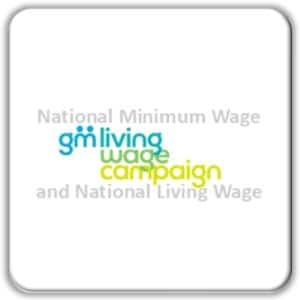 Comment from GMPA, “Under-payment of the minimum wage is a major issue of in-work poverty, particularly exploiting workers from marginalised groups. We fully support HMRC in encouraging low-paid workers to come forward to make sure they are not being underpaid. 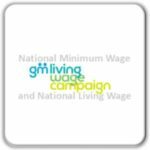 However we take issue with the description of the minimum wage as a “National Living Wage”, which is misleading and confusing for employers and the wider public and does not reflect what is needed to achieve a decent standard of living. The real Living Wage is an hourly rate independently calculated to be enough for a decent minimum standard of living. That rate is £9/hr outside London, a new rate is calculated and announced every November in Living Wage Week, and we encourage employers to voluntarily commit to paying all of their staff that rate, and to become accredited as Living Wage Employers. Almost 150 employers across Greater Manchester have been accredited as Living Wage Employers, including Salford City Council, the GM Chamber of Commerce, and many businesses and charities. Training courses – book now! We have three more training courses scheduled for the remainder of 2019. The next one is our one day ‘Understanding poverty data’ course on Thursday June 5th. This course is for organisations and individuals who wish to strengthen the case for their work by presenting accurate and relevant data about poverty to funders, supporters and policy makers. It is suitable for researcher, third, public and private sector organisations. The multitude of data and reports about poverty that are out there can make accessing the right data difficult. The contentious nature of poverty makes it particularly important to understand how poverty is measured and which figures are the most appropriate to use. By the end of this one-day course participants will have developed an understanding of what key poverty datasets tell us, how best to access data sources and how to use this knowledge to support the work that they do. Later in the year we will be running our ‘Exploring the Poverty Premium’ (September 11th) and ‘Risk of poverty among different groups’ (November 6th) courses. About Exploring the Poverty Premium: Low income consumers in the UK face several disadvantages in the marketplace – known as the poverty premium. This course supports service providers, businesses and policy-makers to identify changes in policy and practice that can help mitigate the impact of the poverty premium, minimising the risk of debt and financial hardship among people on low incomes. This half day course will run on Wednesday September 11th. 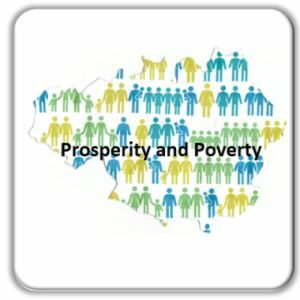 About Risk of poverty among different groups: This course looks at trends in poverty in the UK among different groups. 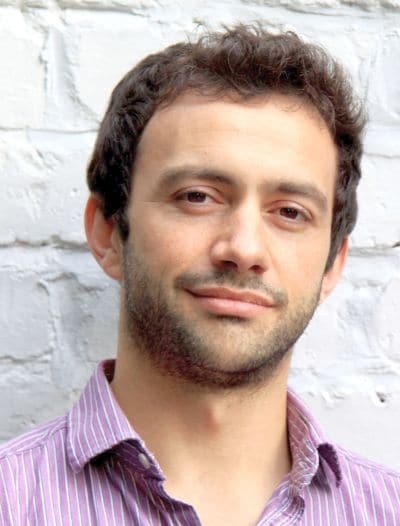 It is designed for organisations seeking to strengthen the case for existing projects or develop new projects aimed at tackling and preventing poverty and will also be of interest to researchers and policymakers seeking to develop a better understanding of poverty in the UK. Next available date is Wednesday November 6th. We have discounted rates for students, third/VCSE sector and public sector attendees. All courses take place at Church House on Deansgate in the city centre, just a short walk from Manchester Victoria and from Exchange Square Metrolink station. 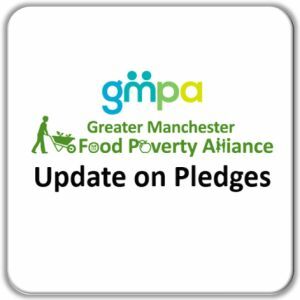 More than 50 pledges have been made by people and organisations across Greater Manchester, to implement the recommended actions in the Food Poverty Action Plan. Here Mylo Kaye from the charity “Pledge” talks about action that he is taking to tackle food poverty. 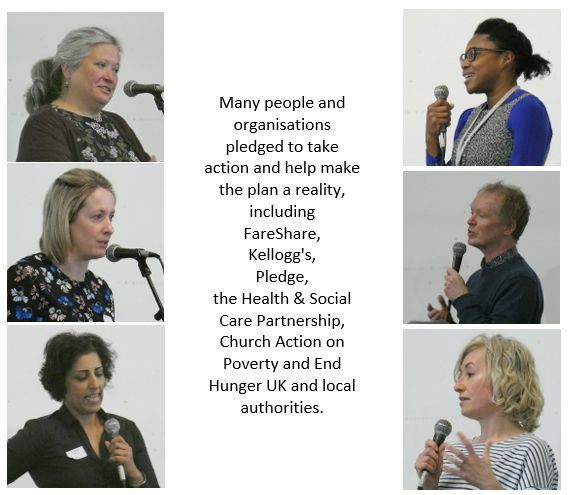 Can you pledge to take action on food poverty by starting to implement one or more of the actions in the Plan? Please read the Action Plan and email to tell us what you will do to make the Food Poverty Action Plan a reality. On an allotment in Stretford, a group of friends led by Kal Gill-Faci are spending most weekends clearing, weeding and getting the ground ready to sow fruit and vegetables that will soon make their way to the tables of Greater Manchester people. This natural, healthy, nutritious food is helping to combat food poverty. Humphrey Park allotments are home to Pledge, a local charity helping people living in poverty. The charity, started last year is focused on ending poverty for those living across Greater Manchester. For the past year, food grown has been harvested and donated to other local charities such as Cornerstone, The Longford Centre, Barnabus, Mustard Tree, Reach Out to the Community & The Globe Food Pantry. These partnerships are vital to the success of ‘Plot for Poverty’ and the initiative couldn’t happen without them. Over 7,400 meals will have been delivered to hungry people across our region by the Autumn, and with the only cost being time, it’s a win-win for local people in need and the charities cooking the fresh food. Typical fruit and veg that is grown are things like Kale, Potatoes, Cauliflower, Onions and Grapes, plus many more. The food makes its way from earth to table in a matter of hours. Local children are also actively involved in the growing. Education around food poverty amongst people who are homeless is essential, these young people are our leaders of tomorrow and we need them to get involved and make their own change. 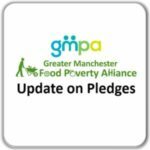 Individuals, groups and allotments across Greater Manchester are encouraged to get involved to help end food poverty in the region, by either starting their own ‘Plot for Poverty’ or by offering time and resources to Pledge to maximise growing efforts in the run-up to the Autumn months. We can all make a massive impact by finding intuitive ways to help people living in poverty, but we can only do this by working together. 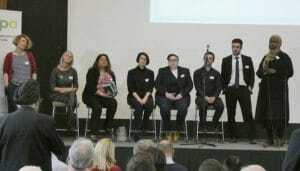 Last week GMPA launched Greater Manchester’s first ever Food Poverty Action Plan to a packed hall in Manchester. The Action Plan was the culmination of 10 months work by over 100 people and organisations, which I have had the privilege of coordinating. With over 600,000 people, including 200,000 children, living in poverty in Greater Manchester and food bank use higher in the city region than most other parts of the country, the plan calls for action by organisations across all sectors to help prevent people falling into poverty, and to support people relying on food handouts out of poverty through advice, support and signposting. 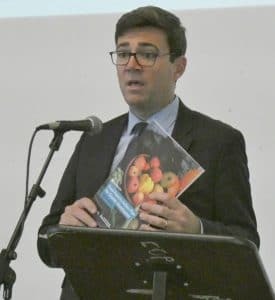 Andy Burnham, Mayor of Greater Manchester, who wrote the foreword for the Action Plan, spoke at the event and pledged that he would write to every public body in Greater Manchester, asking them to implement this plan at the local level. Health services to expand social prescribing for healthy food-related activities such as cooking classes and food growing, and to work with charities and businesses to promote healthy food. 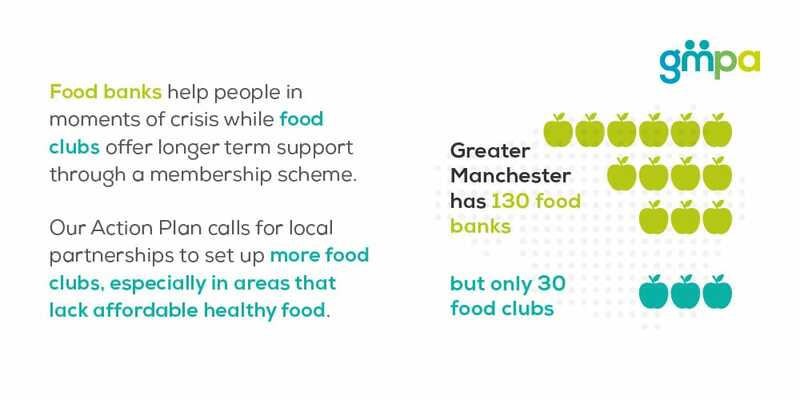 The full plan has more than 70 actions, including something for each organisation in every sector and every borough of Greater Manchester to do, to play their part in tackling food poverty. 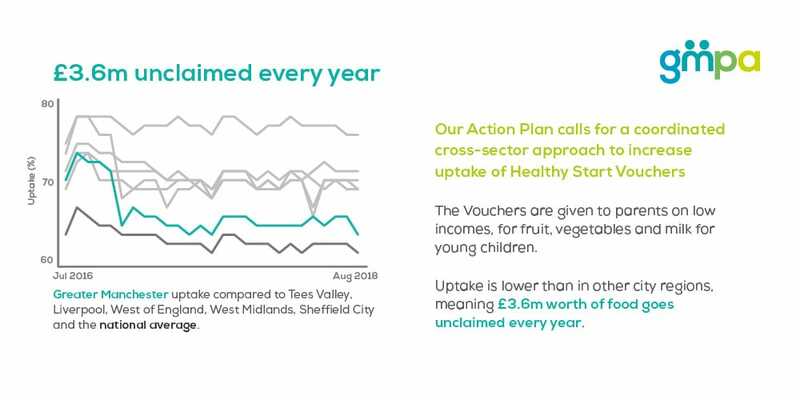 You can find both the summary and the full Action Plan (the more detailed full version will evolve as the plan is implemented, hence the more minimalist presentation) here, along with more information about the Food Poverty Alliance and how it has co-produced the Action Plan. • Ensure that food poverty action is joined up with other action on food. 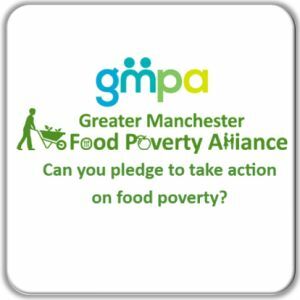 A funding proposal and budget is available on request from food@gmpovertyaction.org. Increasingly it feels like Greater Manchester is moving slowly but surely towards a much stronger and clearer agenda on poverty. Andy Burnham’s work on homelessness, the development of local anti-poverty strategies by some of our local authorities (some of which are detailed here), the interest in Poverty Truth Commissions across the city region and the work of GMPA’s Food Poverty Alliance are all signs of a determination to tackle the issue of poverty through partnership working and in a sustainable and strategic way. A good next step would be embedding tackling poverty and raising living standards within the city region’s economic agenda, recognising the negative impact poverty has on the economy of Greater Manchester through lost human potential and reduced productivity and the need for increased spending on public services. That’s why it was good to see a strong focus on raising living standards and addressing inequalities in the Independent Greater Manchester Prosperity Review, launched last week. The Review was commissioned by the Greater Manchester Combined Authority (GMCA). It updates the Manchester Independent Economic Review (MIER) published ten years ago. The Prosperity Review recognises that whilst there has been strong growth in highly skilled areas such as the digital sector, the city region is also home to a lot of jobs that are low paid and offer poor terms and conditions. The growth in ‘poor quality jobs’ has exacerbated existing inequalities within Greater Manchester and left the city region’s living standards lagging behind those of London and the South East. It has become increasingly accepted that we need to ensure economic activity benefits the lives of everyday citizens. Concentrating on high growth sectors of the economy risks ignoring large swathes of Greater Manchester’s economy, and we can’t expect living standards to rise if we have a two-tier economy – one offering well paid, secure jobs in highly skilled sectors, and the other offering poor quality jobs with limited opportunities for progression in traditionally low paying sectors such as care and retail. Harnessing the role of technology in these sectors should help boost productivity and link them more closely to the ever-expanding digital economy. The challenge will be ensuring workers across the city region benefit from this. We need to develop new ways of measuring that this is happening so that we can better understand whether the ‘economic story’ of Greater Manchester is translating into positive outcomes for its residents. The Prosperity Review will sit alongside the Greater Manchester Industrial Strategy. The Mayor has also been working on a Good Employment Charter aimed at encouraging wider take-up of positive employment practices among employers. More details will be announced later this year. Work on these different elements presents an opportunity to set out an economic programme for the city region that focuses clearly on outcomes for residents. As other approaches set out a stronger agenda on poverty, we need to think about how we link the two so that tackling poverty is part of how we develop and grow the Greater Manchester Economy. Children and young people who rely on school meals during term time, often struggle to be well fed during school holidays. If there is not enough food at home, hunger can be especially acute at these times, which can be socially isolating and detrimental to physical and mental health. 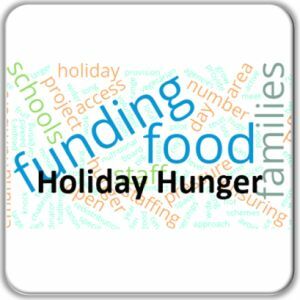 This is a growing concern – 59% of respondents to a National Education Union survey said that children in their school experienced holiday hunger. Of these, 51% said in 2018 that the situation has got worse in the last three years. The government has shown some signs that it may be willing to take responsibility for the issue, with the Department for Education commissioning some pilot projects this year. Specifically there is a total of £9m available for “testing the coordination of free holiday provision (including healthy food and enriching activities) for disadvantaged children during the 2019 summer holidays in up to 9 upper-tier local authorities. The aims of this grant programme are to develop a more efficient and joined-up approach to free holiday provision for disadvantaged children; and to ensure there is enough good quality free holiday provision to meet the demand from children eligible for free school meals (FSM) in the local authority during the 2019 summer holidays.” The bidding process closes on February 7th. 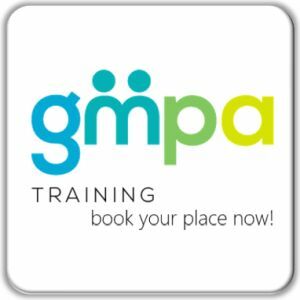 GMPA are encouraging and offering to support bids from across Greater Manchester. To that end, today we publish analysis of a survey that we ran along with Greater Together Manchester last year to get a snapshot of some of the provision during school holidays across Greater Manchester – please download that analysis here, and use it to inform your preparation and activities with children and young people during school holidays. Good practice suggests that in order to reduce the stigma associated with projects that aims to reduce food poverty, any project or service should be focused on the provision of activities that are accompanied by food, and that the project or service should be open to anyone. Last week the new Secretary of State for Work and Pensions Amber Rudd MP acknowledged that key ways in which Universal Credit operates and functions need to be addressed. The first important announcement was that the two-child limit for Universal Credit payments will not apply to children born before April 2017. Whilst this is a welcome change, it still leaves the two-child limit in place for children born after that date, hurting families with more than two children who are already at greater risk of poverty. Many campaigners are rightly calling for the policy to be abolished altogether. One of the major concerns about Universal Credit has been the lack of flexibility around the regularity of payments. Some are concerned that monthly payments cause problems for people used to budgeting on a weekly or fortnightly basis. Amber Rudd is looking at how the system can provide more frequent payments to those people who need them. At GMPA we believe the option of more frequent payments should be made available to everyone in receipt of Universal Credit. That way people will be able to choose the option that best meets their budgeting needs and habits. Other announcements included looking at making is easier for families to manage childcare costs. Action is needed to reduce the complexity of accessing support for childcare and to support parents to meet upfront childcare costs when moving into work. The migration from the legacy benefits system to Universal Credit has placed a huge burden on the government and recipients of support. Amber Rudd said she will look at the migration of people onto Universal Credit to minimise some of the problems this causes for individuals and their families. 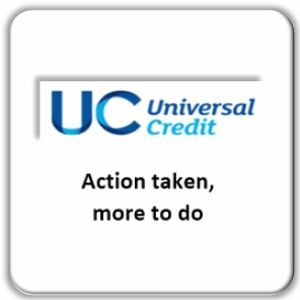 The ideal would be an automatic migration of people from the legacy system to Universal Credit (rather than having to put in a new claim for support), but we are yet to see an indication from the Government that they will follow this course of action. The announcements are welcome but tentative steps towards addressing some of the concerning elements of Universal Credit. In Greater Manchester, many individuals and organisations are fully aware of the challenges created by the implementation and operation of this new social security system. At GMPA we are working with others to understand what can be done locally to improve the way the social security system operates. Please get in touch if you would like to discuss this further. 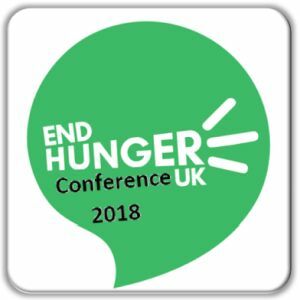 On World Food Day 2018, the End Hunger UK campaign convened its second annual conference in Westminster to discuss the growing movement around household food insecurity in the UK. A broad coalition of food aid providers, think tanks, faith leaders, researchers, local authorities, artists and diverse experts by experience, End Hunger represents a national effort to galvanise public and policy attention to evidently large numbers of people struggling to afford adequate food. We don’t know how large; one panel discussed the ongoing Bill to measure food insecurity nationally via the ONS Living Costs and Food Survey. It is hoped such monitoring would give a more robust sense of the scale and severity of UK food poverty, to be tracked against changes including Universal Credit rollout and Brexit. A key theme of the day, however, was the power of stories and images over stats in capturing public and policy attention to food poverty, its causes and solutions. 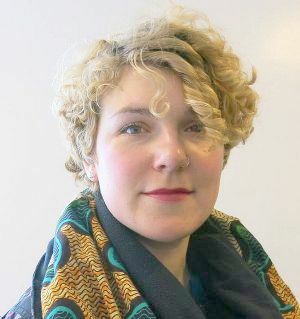 A collaborative photo exhibition, ‘Behind Closed Doors’, has toured the UK with portraits and research into experiences of food insecurity, some displayed at the conference and ending in the House of Commons. We heard young poets recite moving submissions to a recent poetry competition. 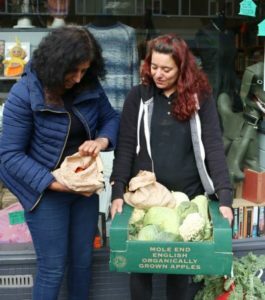 The Food Foundation are collecting submissions of lived experiences towards their Children’s Future Food Inquiry, while the Independent Food Aid Network (IFAN) aim to build an online Story Bank of lived experiences of food insecurity. A panel led by Church Action on Poverty reported research by JRF and the FrameWorks Institute into effective ways to shift public discourse about poverty. 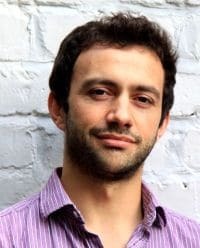 Countering individualising, blame-and-shame accounts requires keying into commonly-held beliefs about the injustice of poverty and government’s responsibility to protect against it, using well-chosen examples and stories rather than relying on numbers alone. Some alliances expressed frustration at local authorities producing poverty strategies yet lacking any funds to turn aims into actions. Public health workers have conducted needs assessments and written proposals that end up ignored by senior colleagues. Yet, affecting national government and company policies that affect benefit and wage levels felt too tough a goal for many of the local alliances I spoke to. End Hunger UK, then, provides one lens through which to target a palpable collective anger. Another potential shared voice was offered by the school students of Blackburn and Darwen who have been organising as part of Food Power’s efforts to involve experts by experience in campaigning. The girls, who shared their stories for a short film, are launching a campaign Darwen Gets Hangry, which they hope will encourage others to turn their own experiences of shame and guilt about being food-poor- or ‘hangry’- into something collective and targeted that can spread to other parts of the UK. struggles of solidarity against the erosion of public entitlements and the human right to decent food. This is an abridged version of an article that Charlie wrote for the Realising Just Cities blog – you can see the full version here.